For the urban area of Sydney, see Botany, New South Wales. The two protrusions into the bay are runways of Sydney Airport. Isaac Smith became the first European to set foot on eastern Australian soil, Cook telling him "Jump out, Isaac" as the ship's boat touched the shore at Botany Bay. Lieutenant James Cook first landed at Kurnell, on the southern banks of Botany Bay, in what is now Silver Beach, on Sunday 29 April 1770, when navigating his way up the east coast of Australia on his ship, HMS Endeavour. Cook's landing marked the beginning of Britain's interest in Australia and in the eventual colonisation of this new "southern continent". Initially the name Stingrays Harbour was used by Cook and other journal keepers on his expedition, for the stingrays they caught. That name was also recorded on an Admiralty chart. Cook's log for 6 May 1770 records "The great quantity of these sort of fish found in this place occasioned my giving it the name of Stingrays Harbour". However, in the journal prepared later from his log, Cook wrote instead: (sic) "The great quantity of plants Mr. Banks and Dr. Solander found in this place occasioned my giving it the name of Botanist Botany Bay". Eighteen years later, in 1788, Governor Arthur Phillip sailed the armed tender HMS Supply into the bay on 18 January. First contact was made with the local indigenous people, the Eora, who seemed curious but suspicious of the newcomers. Two days later the remaining ships of the First Fleet arrived to found the planned penal colony. However, the land was quickly ruled unsuitable for settlement as there was insufficient fresh water; Phillip also believed the swampy foreshores would render any colony unhealthy as the bay was open and unprotected, the water too shallow to allow the ships to anchor close to the shore, and the soil was poor. The area was studded with enormously strong trees. When the convicts tried to cut them down, their tools broke and the tree trunks had to be blasted out of the ground with gunpowder. The primitive huts built for the officers and officials quickly collapsed in rainstorms. Crucially, Phillip worried that his fledgling colony was exposed to attack from Aborigines or foreign powers. Although his initial instructions were to establish the colony at Botany Bay, he was authorised to establish the colony elsewhere if necessary. As such, Phillip decided instead to move to the excellent natural harbour of Port Jackson to the north. On the morning of 24 January the French exploratory expedition of Jean-François de Galaup, comte de Lapérouse was seen outside Botany Bay. On 26 January, the Supply left the bay to move up to Port Jackson and anchor in Sydney Cove. On the afternoon of 26 January, the remaining ships of First Fleet arrived at Sydney Cove. In 1789, Captain John Hunter surveyed Botany Bay after returning from the Cape of Good Hope, trading for grain. The good supply of fresh water in the area led to the expansion of its population in the 19th century. The western shore of Botany Bay remained in its virgin state for almost fifty years after the initial settlement of Sydney Town. Land access to the area was difficult until a route from the west was established via Canterbury. As this route developed it became known as Illawarra Road, which is still one of the main access routes to the south-eastern suburbs of Sydney. The land nearer to this crossing of Cooks River was cleared and settled quite early in the infancy of the new colony. Sydney Airport, Australia's busiest airport, sits on the northwestern side of Botany Bay. After World War II the mouth of the Cooks River was moved two kilometres west to make way for the airport extension. Land was reclaimed from the bay to extend its first north–south runway and to build a second, parallel, runway. The first container terminal at Port Botany, east of the airport, was completed during the 1970s and is the largest container terminal in Sydney. A second container terminal was completed during the 1980s and bulk liquid storage facilities are located on the northern and southern edge of the bay. A third container terminal was completed in 2011. The land around the headlands of the bay is protected by the National Parks and Wildlife Service as Kamay Botany Bay National Park. On the northern side of the mouth of the bay is the historic site of La Perouse, and to the south is Kurnell. Despite its relative isolation, the southern shore of the bay is dominated by an unusual mixture of pristine national park and heavy industrial use that includes Kurnell Desalination Plant, the Caltex Fuel Terminal, sewer treatment, and historical sand mining facilities. On the southern side of the bay a section of water has been fenced off under the authority of the National Parks and Wildlife Service at Towra Point for environmental conservation purposes. The western shores of the bay feature many popular swimming beaches including Lady Robinsons Beach and are highly urbanised. Botany Bay has a diverse marine population, and the area around its entrance is a popular area for scuba diving. In recent times,[when?] the Botany Bay Watch Project has begun with volunteers assisting to monitor and protect the Bay Catchment and its unique marine life. The world's largest population of weedy sea dragon ever surveyed is found at the 'Steps' dive site, on the Kurnell side of the Botany Bay National Park. Weedy sea dragons are just one of hundreds of territorial marine creatures found within Botany Bay. The eastern blue groper is the state fish of New South Wales; it is very tame and is commonly found following divers along the shoreline of Botany Bay. The song "Jim Jones at Botany Bay" (aka "Jim Jones") is about a prisoner who is going to Botany Bay. The song has been recorded several times, including a well-known version by Bob Dylan, and sung by Jennifer Jason Leigh in The Hateful Eight. SS Botany Bay was the name of the spaceship on which Khan Noonien Singh and his followers were exiled from Earth in Star Trek: The Original Series and Star Trek II: The Wrath of Khan. In the play and musical Sweeney Todd: The Demon Barber of Fleet Street, Benjamin Barker, the man who would become Sweeney Todd, was transported to Botany Bay for life on a false charge by Judge Turpin. In the MMORPG Runescape, Botany Bay is the name of a location in-game where players can view other players' accounts being penalized for using "bots", computer macros, to cheat. ^ "Botany Bay". Geographical Names Register (GNR) of NSW. Geographical Names Board of New South Wales. Retrieved 7 January 2013. ^ Lawrence, Joan (1996). St. George Pictorial Memories: Rockdale, Kogarah, Hurstville. Crows Nest, NSW: Kingsclear Books. p. 3. ISBN 0-908272-45-6. ^ "A Short History of the City of Botany Bay". City of Botany Bay. 2012. Archived from the original on 16 July 2012. Retrieved 7 September 2012. ^ Wales, Geographical Name Board of New South. "Extract - Geographical Names Board of NSW". www.gnb.nsw.gov.au. Retrieved 7 November 2016. ^ "Governor Phillip's Instructions 25 April 1787 (UK)". Museum of Australian Democracy. Retrieved 24 November 2013. ^ "Kurnell Peninsula: a guide to the plants, animals, ecology and landscapes". Sydney Metropolitan Catchment Management Authority. 2010. Retrieved 7 January 2013. ^ "Botany Bay Watch Project". Botanybaywatch.com.au. Archived from the original on 18 July 2008. ^ "Marine Blue Groper". Botanybaywatch.com.au. Archived from the original on 19 July 2008. ^ Schwartz, Larry (15 April 2011). "Blowing in, yet again". Sydney Morning Herald. FairFax Media. Retrieved 6 September 2018. ^ "Botany Bay". Runescape. Jagex Ltd. 26 September 2012. Retrieved 6 September 2018. ^ Senior, Tom (4 May 2016). "Runescape puts botters on trial in Botany Bay and lets players decide their fate". PC Gamer. Future US, Inc. Retrieved 6 September 2018. Britton, Alex R., ed. (1978). Historical records of New South Wales. Vol. 1, part 2. Phillip, 1783-1792. Lansdown Slattery & Co. p. 56. OCLC 219911274. Forster, George (2008). Allgemeines historisches Taschenbuch, oder, Abriss der merkwuridgsten neuen Welt Begebenheiten enthaltend fur 1787 [Neuholland und die brittische Colonie in Botany-Bay/New Holland and the British colony at Botany Bay] (in German). Robert J. King, translator. Canberra: National Library of Australia. Tench, Watkin (2006). Anacharsis (ed.). 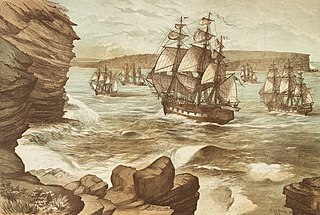 Le texte fondateur de l'Australie, récit de voyage d'un capitaine de la First Fleet durant l'Expédition à Botany Bay (in French). preface by Merle, d'Isabelle. p. 320. ISBN 2-914777-30-2. Archived from the original on 25 November 2006. Retrieved 24 May 2011. Wikisource has the text of the 1911 Encyclopædia Britannica article Botany Bay. Wikimedia Commons has media related to Botany Bay, Sydney. Wikivoyage has a travel guide for Botany Bay. "Georges River catchment" (map). Office of Environment and Heritage. Government of New South Wales. Port Jackson, consisting of the waters of Sydney Harbour, Middle Harbour, North Harbour and the Lane Cove and Parramatta Rivers, is the ria or natural harbour of Sydney, New South Wales, Australia. The harbour is an inlet of the Tasman Sea. It is the location of the Sydney Opera House and Sydney Harbour Bridge. The location of the first European settlement and colony on the Australian mainland, Port Jackson has continued to play a key role in the history and development of Sydney. The History of Sydney begins in prehistoric times with the occupation of the district by Australian Aborigines, whose ancestors came to Sydney in the Upper Paleolithic period. The modern history of the city began with the arrival of a First Fleet of British ships in 1788 and the foundation of a penal colony by Great Britain. Circular Quay is a harbour, former working port and now international passenger shipping port, public piazza and tourism precinct, heritage area, and transport node located in Sydney, New South Wales, Australia on the northern edge of the Sydney central business district on Sydney Cove, between Bennelong Point and The Rocks. It is part of the local government area of the City of Sydney. St George Area refers to an old County Council formed by the local councils of several southern suburbs in Sydney, in the state of New South Wales, Australia. The area includes all the suburbs in the local government area of Georges River Council and the part of Bayside Council which was Rockdale City prior to 2016. The eastern boundary of the district is Lady Robinson Beach on Botany Bay. Port Botany is a suburb in south-eastern Sydney, in the state of New South Wales, Australia. Port Botany is located 12 kilometres south-east of the Sydney central business district, in the local government area of the City of Randwick. Port Botany sits on the northern shore of Botany Bay, adjacent to the suburbs of Matraville, Banksmeadow and Phillip Bay. The Gweagal are a clan of the Dharawal tribe of Indigenous Australians Their descendants are traditional custodians of the southern geographic areas of Sydney, New South Wales, Australia. Lady Robinsons Beach is the stretch of beach between the mouth of the Cooks River and the mouth of Georges River on the western shore of Botany Bay in Sydney, New South Wales, Australia. Originally known as Seven Mile Beach, it was renamed after the wife of the then Governor, Sir Hercules Robinson. Isolated settlements separated from the beach by sand dunes were also given the name of Lady Robinson's Beach as their postal address. The Woolooware Bay is a bay on the lower estuarine Georges River in southern Sydney, in the state of New South Wales, Australia.